The Daytona 500 is a spectacular NASCAR event that takes place the last weekend of February at the Daytona International Speedway in Daytona Beach, Florida. 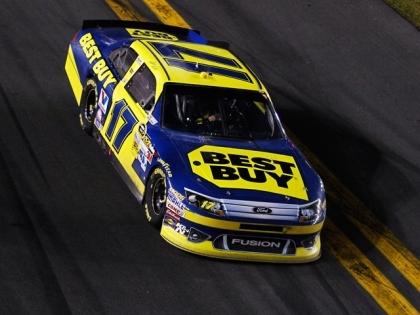 It is considered the most important race on the entire NASCAR calender and pays the most money to the winner. Bill France started this race, and it has been an annual event since 1959. 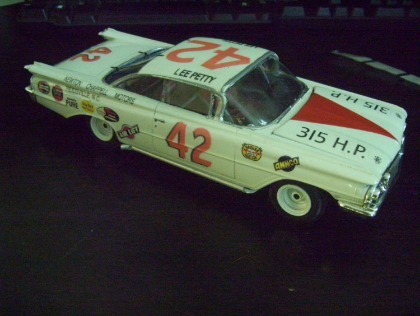 Lee Petty, father of NASCAR's most winning driver ever, Richard Petty, won the first Daytona 500 in 1959. His son Richard Petty has won the race a record seven times. My favorite driver of all time, Florida's own Glenn "Fireball" Roberts, won the race in 1962. He was killed in 1964 as a result of burns suffered in a crash at the Charlotte Motor Speedway in North Carolina. In the early days, the stock cars looked like your average family car but with ads and signs all over. You could imagine yourself being Lee Petty while driving your dad's car. His winning car is shown in the picture below. Since it is also the first race of the year, it is different than other sports that have their playoffs, Super Bowls and other tournaments at the end of the year. Another thing that makes this race different is the starting order. All starting spots other than the first two are assigned based on the results of two 150 mile qualifying races held the Thursday before the race. The front row spots are assigned based on time trials done the Sunday before the race. Each driver gets two laps alone on the track to post their best speed. The top two drivers from that trial are assigned to slots on the front row. The Daytona 500 is one of four NASCAR races that require cars to use restrictor plates to keep speeds down to a somewhat safe level. It is still a dangerous race, and the memory of Dale Earnhardt being killed on the last lap of the 2001 race is still a heart breaker for NASCAR fans. The Daytona 500 is the most popular recurring race in Florida, and the tickets can be very expensive depending on where you want to sit. The grandstands seat 147,000 people and they always seem to be filled. The cheapest grandstand seats I've been able to find are $73 each, but far more expensive packages with better views are also available. Cars have evolved over the years so they no longer look like the sedan you buy from your friendly local dealership. If you want an unusual experience, camping is allowed in the infield areas. Many campers watch the race from chairs perched on the roofs of their RV's. Packages are sold that include admission for at least two people, a spot for your RV and a pass also for your tow vehicle. These tickets are very expensive, but put you right in the middle of the action and provide an unforgettable experience. A museum dedicated to the race is next door to the Speedway itself. Ticket Information available, or call 1-800-PITSHOP.